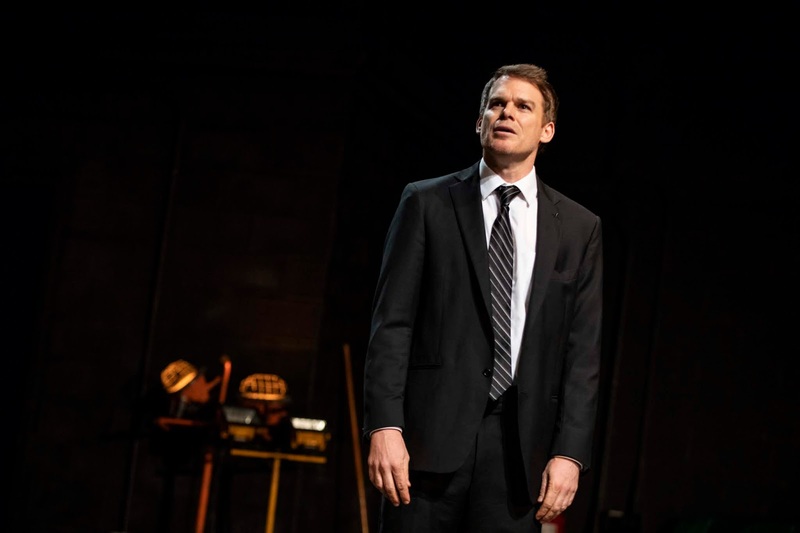 Michael C. Hall, no stranger to playwright Will Eno, having appeared in the “The Realistic Joneses” on Broadway in 2014, takes on Eno’s intriguing 2004 monologue and delivers quite a bravura performance. From his first few minutes on stage in almost total darkness, Hall authoritatively commands the stage with his voice alone. Eventually the lights come on, and there he is, attired in a dark suit with tie (courtesy of costume designer Anita Yavich), addressing the audience, as if extemporaneously, and ruminating in a seemingly stream-of-consciousness discourse about the meaning of existence, our part of the universe, life’s pain and randomness, love and fear, free will, and other weighty matters. Alternately world-weary, teasing, forgetful, confidential, affable and severe, throughout the play, he toys with the audience. At one point, he descends into the auditorium, looking for a volunteer to join him on stage. (It’s one of those scary “Oh, please don’t let it be me” moments, especially as he indicates it’s for someone who might “like a little violence.”) I won’t reveal what transpires. His character’s musings begin with the image of a small boy standing by a puddle whose beloved dog gets electrocuted in front of him by a downed power line. He would seem to be speaking of himself, but we never really know for sure. Later there’s talk of a past failed relationship but details are sketchy. And there’s lots of animal imagery.”I don’t like magic,” he asserts a couple of times, but then seems on the verge of performing some. The piece (only about 70 minutes) is, by its nature, repetitive, and one man sitting close to the stage rudely or perhaps just unthinkingly, sighed audibly several times, probably echoing the feeling of others. But the play is thought-provoking, and Hall proves himself a master of his craft. What a marathon part! In addition to the sheer memorization required for such a lengthy monologue, the work is filled with shifting moods and endless non-sequiturs. Laughter, when it comes, is slightly uncomfortable, especially as early on, Hall’s character chides the audience for its uneasy chuckles. There’s plenty of intentional humor here, though. “You’ve changed,” a woman once said to him, be adds it was he adds, “the night we met.” And the light banter throughout balances Eno’s more sobering insights into what makes us human, including our memories, our history, and our thoughts. Amy Rubin’s set -- mostly a bare stage with some upstage props: a door frame, chair, ladder water cooler -- echoes the desolation and mystery of the piece. Jen Schriever’s lighting is key to supporting the text. Oliver Butler, who directed the premiere of Eno’s “The Open House,” shows his affinity for the playwright’s work with a sensitive and cannily-paced production. (The Irene Diamond Stage at The Pershing Square Signature Center, 480 West 42nd Street; signaturetheatre.org; through December 2).